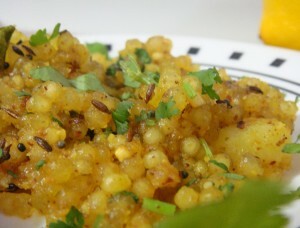 Sabudana Khichadi: Sabudana khichadi is an Indian dish made from soaked Sabudana (Sago). It is usually prepared in western parts of India especially in Gujarat & Maharashtra. It is the dish of choice when somebody is observing a fast during Navratri. The Sabudana Khichadi is filling in nature and has a high energy content, therefore, it serves as ideal food during fasting. Wash the sabudana well until the water runs clear. Soak sabudana, with enough water to cover it, for about 5 hours. Sabudana is ready for use, when you are able to press it with your fingertips, but it does not disintegrate easily. The sabudana pearls should remain separate, when you take some in your hands. Rub the peanuts with yours hands, after roasting, to peel the skins. Grind the peanuts to a fine powder using a food processor. When the skillet is hot, add the cumin, thinly sliced chillies, asafoetida and turmeric powder along with curry leaves. Mix well for 30 seconds. Add the sabudana and give a quick toss with the rest of the ingredients. Add the peanut powder with sugar and salt as per your taste. If the sabudana khichadi is little dry, then sprinkle some water (very little). Garnish with Cilantro and lemon juice. If you do not have the time, you can warm the water (not hot) and soak it for just 2 hours. 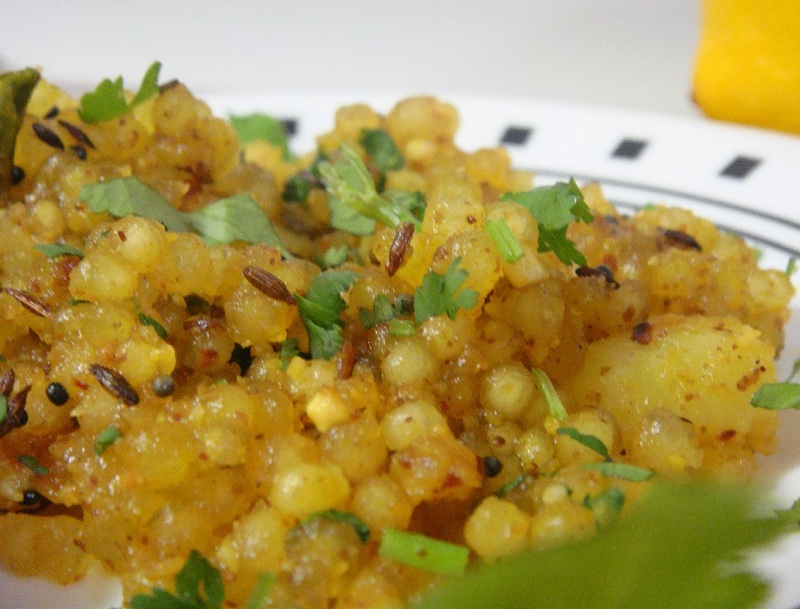 If you have any queries about this Sabudana Khichadi Recipe , please write down in comment box below.